Chain-Stitched Elephant Cushion Covers from India (Pair), "Elephant Bonding"
Sajad captures the relationship between a mother elephant and her playful calf in India's aari chain-stitch embroidery. Designed in shades of jade, aloe and sage, the hues complement the lush champagne base of a pair of cushion covers. Each cushion case features jade piping and a zipper closure on its plain cotton canvas back. 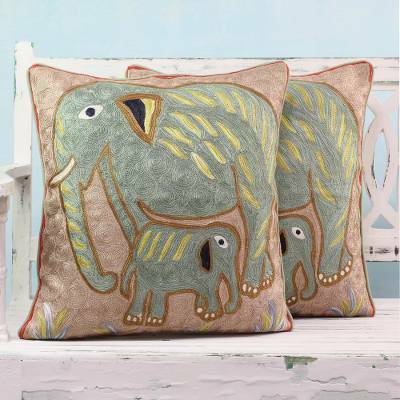 You can find cotton cushion covers 'Elephant Bonding' (pair) by Sajad in pillows & throws categories such as Animal Themed Cushion Covers, Mother and Child Cushion Covers, Cotton Cushion Covers and Rayon Cushion Covers. Enjoy exploring these sections for other Novica treasures.